The Clyde Stations are a group of survey stations circling the Isle of Arran in the Firth of Clyde (Scotland). 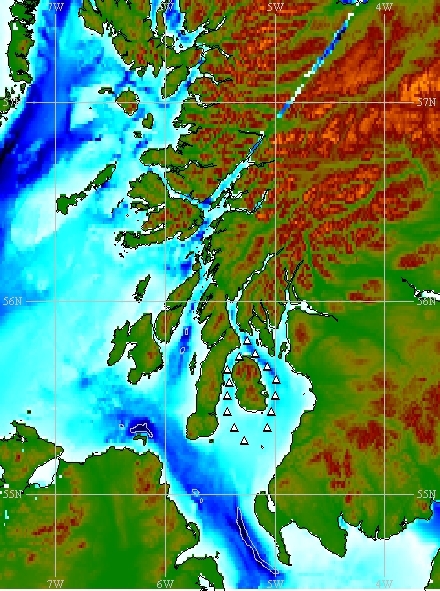 The group comprises 14 fixed CTD stations, which were established as part of routine monitoring work on the Scottish continental shelf by Dunstaffnage Marine Laboratory (DML). The Clyde Stations were occupied during the 1980s and 1990s. The white triangles indicate the nominal positions of each standard DML Clyde Station. DML Clyde Station CL11 is one of 14 fixed CTD stations circling the Isle of Arran in the Firth of Clyde, Scotland. The station was established by scientists at Dunstaffnage Marine Laboratory (DML).